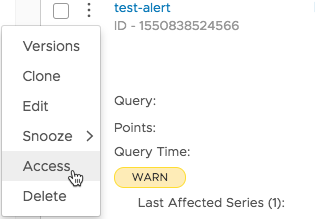 Add and remove access to one or more individual alerts from the Alerts browser. Edit an alert and use the Share icon to give access to other users and groups. When you change the Security system preference, you now affect both dashboards and alerts. Super Admin users control access to any alert. They can also restore orphan alerts if the Everyone group was removed. The Everyone group is assigned access to each alert by default. You can see that for each dashboard by selecting Access from the vertical dots icon. This release includes multiple performance and stability enhancements.